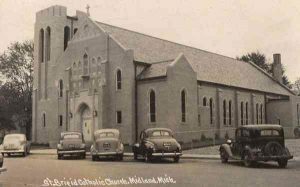 The first permanently organized Catholic Church in the Midland area began about 1866, stimulated by the arrival of the William B. Keeley family from Ireland by way of Canada. With other Irish Catholics in the area, they gathered in homes to pray together. In 1870 they bought two lots on the corner of Indian and Haley Streets. Construction of Saint Brigid Church was completed in 1871 with the help of a gift of $100 and most of the lumber from John Larkin, the first of many non-Catholic donors. Saint Brigid Church was a mission church, served by a priest on horseback from Saginaw. In 1884 it became a parish serving Midland County, Auburn, and Freeland. During these formative years, this pioneer group of families were guided by Fr. Thomas Burns, succeeded by Fr. Thomas McNamara and later by Fr. Dennis J. Malone. In 1908, Benjamin Bradley offered to sell his residence and two lots at Ashman and Larkin to Saint Brigid Church. The residence, now known as the Bradley House, became the parish rectory. Needing money to finance this venture, Fr. Malone requested donations. Herbert H. Dow, who had established the Dow Chemical Company a decade earlier, offered him $1,000.00 cash, or the equivalent in stock. Needing immediate money, Fr. Malone accepted the cash. The moving of the church building in 1908 took three weeks with the rollers inching along the streets of Midland. The event was the highlight of Midland’s social life, culminating with a huge party put on by the Ladies Altar Guild. In 1921 the name of the parish was formally changed to Saint Brigid, the original intention of the founding families. The parish growth continued with the opening of Saint Brigid School in 1922 with 150 students taught by the sisters of Mercy who left in 1981. the school is now staffed by lay teachers. By 1940 a larger church structure was needed. In 1941 the current 800 seat Tudor Gothic structure was dedicated by Bishop William Murphy. The three marble altars, donated by Mrs. Herbert H. Dow, would not arrive from Italy until six years later, as they were hidden in a cave during the war. The original church organ was purchased from the Old Frolic Theater. this was replaced by an electronic organ and then in 1993 by the current Berghaus Organ. Still remembered, with a wealth of stories, are long-time pastors Msgr. Joseph Illig and Fr. Thomas Ryan. Also fondly remembered are the Redemptorist priests who staffed Saint Brigid Parish from 1970 to 1990. For 60 years the Bradley House served as the parish rectory. In 1969 a new rectory was designed by Alden B. Dow Associates. The Bradley House was purchased by the Midland Historical Society and was moved to Emerson Park to become part of the Historical Society Museum. 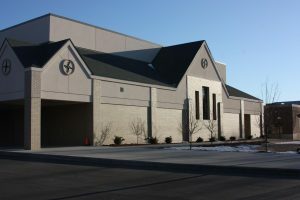 In 1983, James Hickey, the former Cardinal Archbishop of Washington, D.C., an altar server and graduate of Saint Brigid School, blessed the new school and parish center. Through the years at least six men from Saint Brigid Parish, including James Cardinal Hickey, have been ordained to the priesthood. In 1978, and again in 2006, three permanent deacons were ordained for Saint Brigid, Frank Hudson, Al Oliver and Dan Corbat. In 2006 we celebrated our 135th anniversary with a festival of liturgies and parties. 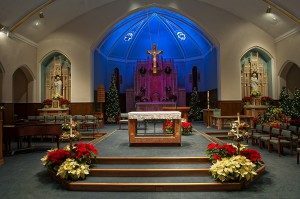 In 2008 we began the process of refurbishing our church and extending our school and parish center. This resulted in the beautiful worship space you see today and much needed extra space for school and parish use. In 2017 we celebrate the 95th anniversary of Saint Brigid School which now has 118 students in Kindergarten through Eighth Grade.